A credible source of nutrition information and houses numerous printable handouts on general healthy eating that you could share with your families. Site is also home to WHO Growth Chart information and supporting documents. Please let your clients know that reliable information and advice on nutrition and healthy eating from registered dietitians are available at UnlockFood.ca or by calling Telehealth Ontario toll-free at 1-866-797-0000. Nutrition and menu planning information and tools for all ages and stages (e.g., eating for a healthy pregnancy, eating well from birth to seniors). Sample menus and snack ideas. Ideas for healthy school lunches. Kitchen tips for safe food handling. Information to help you read food labels. Food budgeting tips and tools. Information for managing nutrition related disease (e.g., diabetes and heart disease). Recipes, videos, nutrition apps and so much more! Health Canada is the Federal department responsible for helping Canadians maintain and improve their health. It contains guidance documents for health professionals for all ages and stages, along with practical tips and tools (e.g., Pregnancy weight gain calculator). 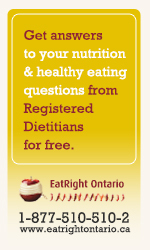 ‘Health’ is Health Canada’s consumer friendly information website for your clients. It contains videos, handouts, and information on topics such as eating well, physical activity, food recalls and much more.